Let’s get you started out on the right paw! Whether your new family member is a new puppy or rescue dog, early experiences together set the stage. In our excitement of bringing home our furry friend we all make mistakes. These are the 5 most common mistakes we encounter and want to help you avoid the pitfalls. Set yourself up for a lifetime of joy with your furry bundle of love! One of the most common mistakes is an easy one to make, especially when we first bring home that teeny-tiny adorable puppy. We are excited and we love it when they want our attention. So when your little puppy jumps up on you, it is welcomed – “look at how cute he is!” Fast forward and your furry friend is now big. He is out in the yard after a rainy day, and you call him. He comes happily and jumps up to greet you, leaving his muddy artwork all over your clothes. Many of us as dog parents actually do not mind our dogs jumping up to greet us…most of the time. But things like muddy paw prints make it not so much fun. Or, it may be an unwelcome greeting to a visitor to our home. If your puppy or newly adopted rescue dog learns from the start that jumping up on people gets him attention, he will jump up on anyone that comes within his reach. For him it is a wonderful way to get close and personal for greetings and love. After all, it’s what we taught him from day one. The good news is dogs are brilliant learners and can learn signals saying “okay to jump up right now,” and refrain from jumping when this invitation is absent. The place to begin is teaching your dog to sit. Teach him that ‘sit’ gets that attention he so seeks. When he makes an error and jumps up, your job becomes helping him understand this does not work. Jumping up makes you go away. Then repeat: try again – lavishing him with praise, love and yums when he gets it right. If you are consistent and match the right consequence to the right behavior, you will have your dog sitting for greetings quickly. Jumping up makes people go away. Sitting or keeping all four of those paws on the floor gets all the attention a dog could ever desire. Avoid yelling, scolding or waving your arms to push him away. Remember he was seeking your attention and your attention is what he got! Most new puppy owners have seen or heard the term “Socialization” and heard about the important role it plays. I have heard many new puppy owners happily express the great measures they take to get their new puppy out to the Dog Park or Doggy Daycare for socializing with other dogs. This is worrisome. Meeting and greeting other dogs is only one piece of socialization. And, whom they meet, how they meet them and what happens when they meet needs to be top of mind always. Puppies in the ra nge of 3 weeks to approximately 16 weeks are in what is referred to as their “Socialization Period”. First experiences of anything during this time will have great impact on how your dog perceives these particular experiences and future new experiences. Meeting and greeting other dogs, people approaching your pup (whether they are men, women, children, wearing hats, boots or sunglasses, are running or walking: all are different pictures to your pup), objects that move on their own like Roombas, various noises, differences in the surfaces that they walk on (does it move or make a noise as he steps on it) are the kinds of things we want to ensure your puppy has good early experiences with. His very first experiences with new things will have great impact on whether they are enthusiastic about such things or afraid. As you may have noticed, some of this time passes before your puppy enters your life. A good rule of thumb when looking for a new puppy is to inquire about what measures have been taken to help this puppy during his socialization period. Excellent breeders and rescue organizations put big effort into helping their puppies be well prepared to go out into the big world. There are important action items and techniques for helping your puppy become a well-rounded dog, able to go out and about in the world with you. Preparation while he is young is key. Why is one of the most important things we need to teach our dogs so frustrating and challenging? Because, unknowingly, our actions often teach dogs that coming when called equals not so good things for dogs. Think about it. You call, and it is time to leave the park. You call, and it is time to go into the crate. You call, and it is time for putting drops in the ears, a scolding or punishment. When “Puppy, come!” so often predicts the end of fun or, worse yet, yucky things for dogs, your dog learns coming to you is just not a good idea at all. The best solution for this is to teach your dog an emergency recall. Use a word (a new one entirely if the old one you have been using rarely works) and make sure when your dog comes running, something magnificent (according to your dog) happens. Begin teaching this new word when your dog is not preoccupied with something else. Out of nowhere, your dog suddenly hears this new sound and wants to go investigate what is going on. When he arrives at your feet the party begins. Praise, laughter, cheering and chicken rain from the skies. Not one little piece of chicken, but lots: chicken literally rains from the skies! You want to make an impression – this is AWESOME! Repeat this randomly once or twice a day. Once your dog will wake from a sound sleep, bounding at full speed to you, you can move your practicing efforts to the yard. Wait until your dog has completed all his sniffing and frolicking, looking around as if to say “hmmmm, what else is there to do”. 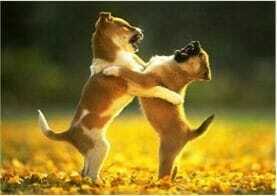 Say your special word or sound, and celebrate with your dog once again the moment he is at your feet. Do not progress to making this game more challenging for your dog until he is spot on each and every time. After enough practice, you will even be able to use this at the dog park. But do not ever stop the celebration along with a small morsel of something yummy. After all, your dog wants to stay and play at the park. You want to leave. When he comes after your call, he has given up his desires and given you yours. Say thank you in a way that is meaningful to him. It seems like common sense for most folks to scold, yell or yank on a leash when their dog growls. It’s scary and we find it embarrassing, so we want it to stop. Sometimes it temporarily works and the dog does stop. But, did the owner achieve what we really wanted? Most likely not, as what we really want is for it to not happen again. We don’t want to teach dogs to no longer growl. We want to know what is causing them to growl and change how they feel about it. Growling is not the problem, what they are growling about is. Dr. Ian Dunbar warns “do not remove the ticker from the time bomb.” Punishing a growl and not uncovering what is causing your dog to be upset only teaches a dog to not let you know when they are upset. If your dog is displaying aggressive behaviors get qualified professional help immediately! 5. 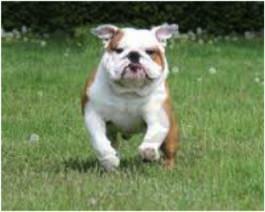 Management – practice makes perfect, what is your dog practicing? There are oodles of rewards our dogs gain that we are not always aware of. 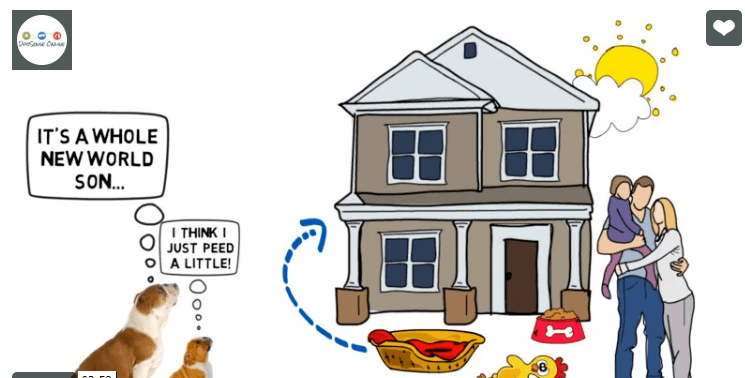 For instance, your dog jumps up on the counter, he gets a snack. He goes potty in the house, he gets relief from a full bladder. 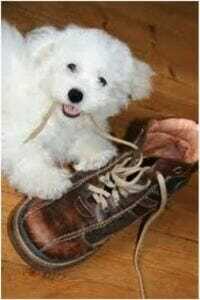 He grabs your shoe, it is great fun to chew on and sometimes results in a fantastic game of chase with you. He barks at you for attention, and you implore him to stop. It worked! Your attention is what he got. The best part about management is that it often trains our dogs without any further effort. If your dog only has access early on to legal items for chewing, he’ll get hooked on chewing the toys that are meant for just that. Whenever you witness a behavior you would prefer your dog not do, think about ways you can prevent him from doing it. Remember, if an action is rewarded, that action will be taken again. Until next time, Have Fun & Enjoy Your Dog! P.S. Don’t forget to check out our online dog training program for living your best life with your dog! P.P.S. Don’t miss our local services in Minneapolis, Minnetonka & Edina, MN areas providing In Home Puppy & Dog Training Minneapolis and Minneapolis Puppy Classes for a Go Anywhere Dog™. I've been on a mission to decode how the dogs we love see the world and what really gets them motivated so that we can transform the way we train them. Now I want to teach this to you! Join me in revolutionizing dog training. A fresh new approach for the 21st Century urban or suburban lifestyle. I’ve enjoyed my work as training and behavior consultant for Safe Hands Rescue and resident dog expert for PetChatz. I founded a state of the art dog daycare, serving over 2,000 dogs and their guardians. I now continue to consult with dog daycares nationwide on how to enrich environments for the dogs in their care while using effective rewards and motivators to improve behavior. I’m also a very proud graduate and a certified trainer through the Academy for Dog Trainers, the world’s best dog behavior and training program taught by Jean Donaldson. I've wholeheartedly dedicated my life to helping people and dogs live amazing lives together. Passion, Education & Experience. Join me, I'd love to teach you what I've learned.